Everything Bamboo Wooden Tea Bag, Condiment or Small Accessories Storage Organizer Caddy with Clear Lid & 8 Compartments. Secure Portable Storage - Strong magnetic closure holds lid securely closed for stable moving & storing. Finger indentation allows you to open the box quickly & easily. Made from High Quality 100% Natural Bamboo; not only is it tough & durable, it is perfect for the storage of tea having natural antibacterial properties. 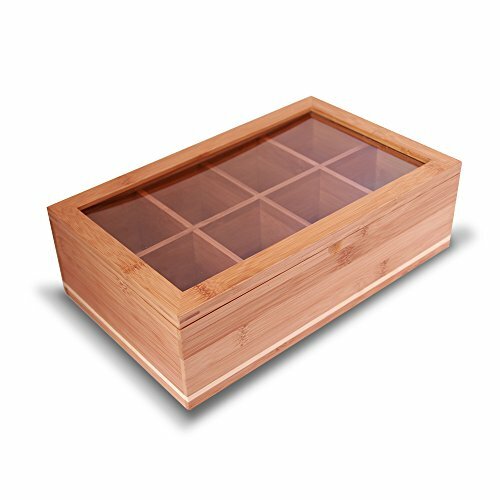 Eight equally divided compartments make it easy for you to sort, store & select your entire range of teas (each compartment measures 2 6/8" x 3 1/4") Attractive design featuring an accent line as well as an elegant looking hinged acrylic lid allowing you to not only store but display your contents. Multipurpose organizational display box can be used to store not only tea but condiments & any small accessories you wish. Also makes a great gift for any home! Multipurpose organizational display box can be used to store not only tea but condiments & any small accessories you wish. Also makes a great gift for any home! If you have any questions about this product by Everything Bamboo, contact us by completing and submitting the form below. If you are looking for a specif part number, please include it with your message.